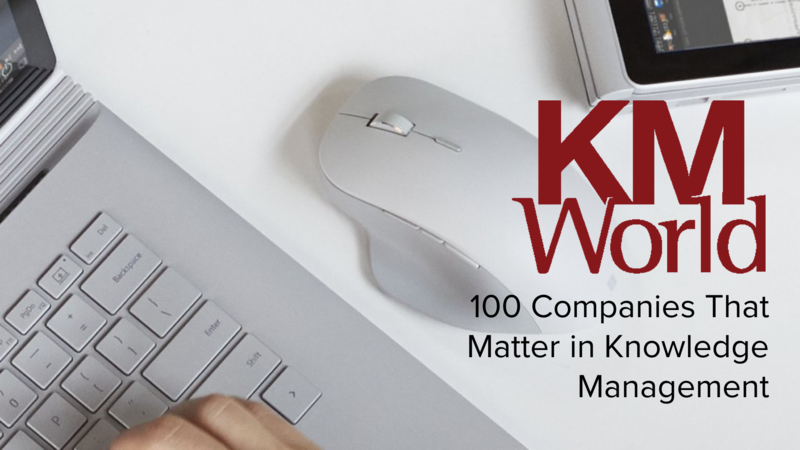 Earlier this month KMWorld released their “100 Companies That Matter in Knowledge Management” list for 2018, and we are honored to say we are featured for the fifth time. Summit 7 Systems is also listed among companies such as Google, Microsoft, and Nintex in this year's group. Companies chosen are "compiled over the course of the year via input from editors, analysts, experts and, most importantly, users", according to the publication. "It consists of companies that capture our attention for various reasons including functionality, demonstrated success with clients, creativity and innovation." KMWorld is the leading magazine and website for news and information regarding knowledge management, content management, and document management. Every year they release the Companies That Matter in Knowledge Management list to highlight companies who demonstrate a commitment to solving the toughest challenges in knowledge management and best contribute to the overall community..